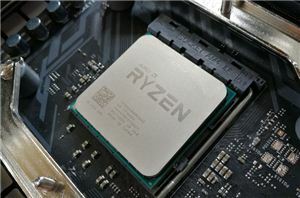 This week at Computex thus far, we've seen two big CPU-related announcements. 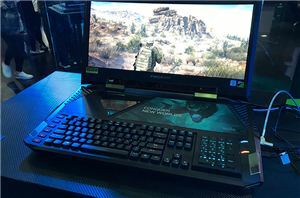 The first was the launch of the Intel i7-8086K, a six-core limited edition processor at 5 GHz that is coming out later this week. 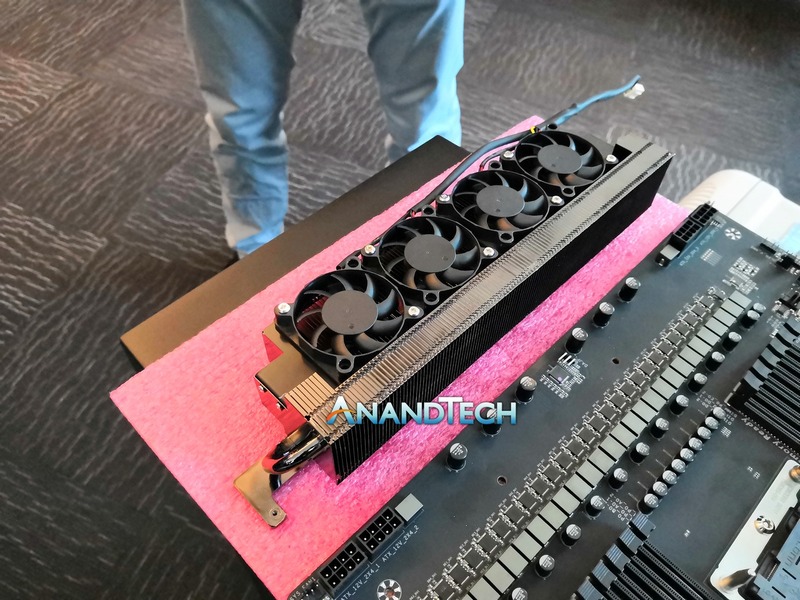 The second was the behemoth: Intel showed a prototype 28-core system running at 5.0 GHz, and stating that it will be coming out at Q4. Not a lot else was said, however since the announcement we have dug deep to get some more information, and today we were one of a small handful of press to actually have a chance to get some hands-on with the system on display. Here’s what you need to know. The new processor runs in the LGA3647 socket, which is Intel’s Xeon enterprise socket with 3647 pins. These processors are huge, and no consumer motherboards exist for them as the design is purely for servers and enterprise. The platform also supports six memory channels, so we have a hex-memory channel design. 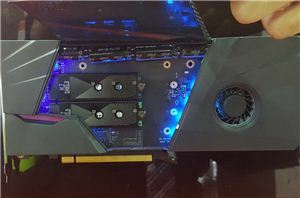 This was evidenced by the close up images taken from Intel’s Keynote during Computex. At the keynote, Intel also demonstrated a Cinebench R15 score with the processor running at 5.0 GHz on all 28 cores. The benchmark is a common multi-threaded workload to ramp up all cores to a reasonably high load level. The score in the keynote was 7334 points. Working from data taken from Intel’s current 28-core Xeon processor, the Xeon Platinum 8180, shows that the 8180 at 3.34 GHz can achieve a score of 5040. Doing the math and assuming perfect scaling (which Cinebench does well at) shows that the same processor at 5.0 GHz would score around 7560 points. The difference between that number and the 7334 that Intel scored is within the ballpark, so we are likely looking at an overclocked version of the Intel Xeon Platinum 8180. In our previous article I suggested that the processor could be two smaller dies connected by EMIB, or through QPI, on the same package. It was, sad to say, wishful thinking, however it is clear that Intel cannot stick to monolithic dies on the latest process nodes forever. At the keynote, systems from ASUS and GIGABYTE were shown, each looking fairly hefty and bulky. 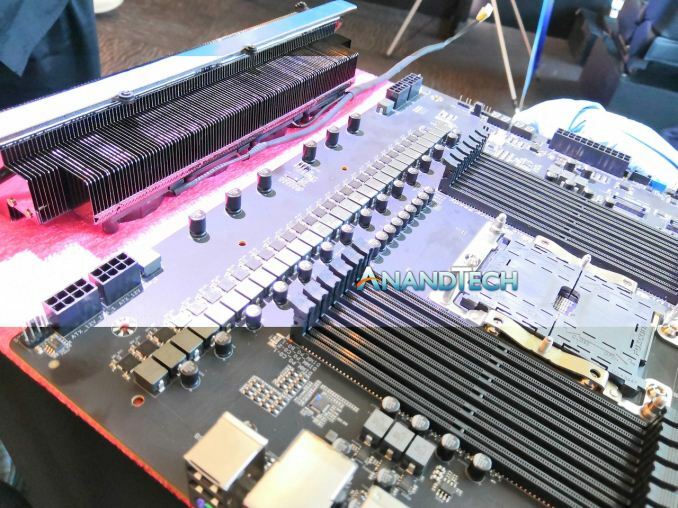 As noted previously, the LGA3647 socket is a server socket and platform, so for this 28-core product to be available to consumers, we will have to see some consumer-grade motherboards coming to market. There is a precedent for this – about 10 years ago Intel released a SkullTrail platform, which used two QX9775 processors in a dual processor motherboard that only Intel produced. That platform was mightily expensive, and hard to acquire – only the big boys had access to it. Chances are we will see the same again here. On the matter of power consumption – we have seen estimates from our readers about power consumption ranging from 300W all the way up to 1 kW and beyond. Of course this is no ordinary chip, and overclocking it beyond its specifications is going to draw some excessive heat. At the keynote, some zoomed in photographs from our colleagues over at Tom’s Hardware show a very large pile of tubes coming out of the rear of the system. There ends up being two levels of speculation here: either Intel is using a water cooler (likely with a water chiller), or there is phase change cooling in play. 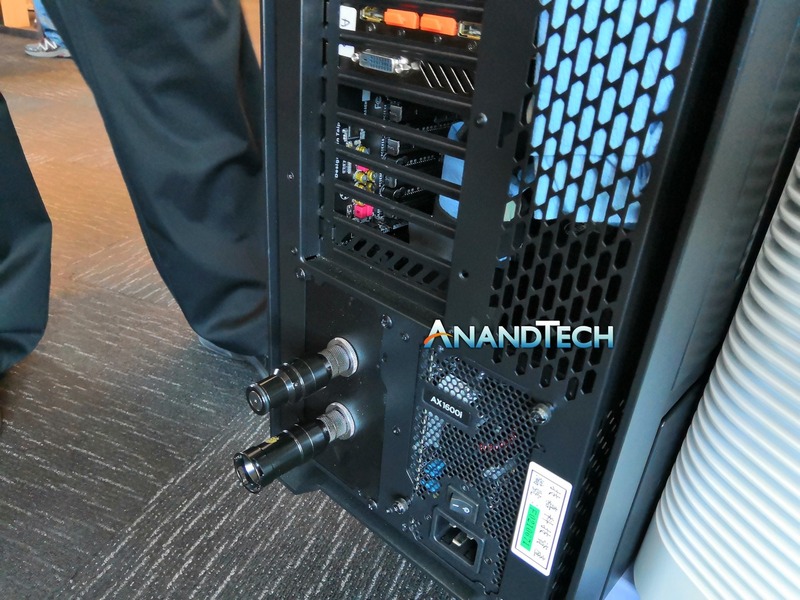 The latter relies on sub-zero temperatures, which creates moisture and ice around the socket, and Intel’s demo was fairly clean, so personally I believe that a water chiller is in place. A common water chiller for overclocking can run up to 1500W, although the mid-sized ones are around 500-800W, and can cost a few hundred dollars. That doesn’t give much of an insight into what we are dealing with here, especially as it is an issue about clock speeds. At the event, Intel said the CPU reached 5.0 GHz, and the tools on display showed a 5.0 GHz reading on all cores. It was not stated if this was overclocked, however most people have come to the conclusion that the processor was. The Intel Xeon 8180 has a base frequency of 2.5 GHz, a turbo of 3.8 GHz, and an all-core frequency of 3.2 GHz. If we allow for the fact that Intel could likely bin this processor higher, around 3.0 GHz base to 4.0 GHz turbo, then we are looking at a substantial overclock. Pricing is still anyone’s guess. If we take the Xeon Platinum 8180 at $10k, then assume that for consumers it might have the ECC part removed (it can also be binned such that QPI doesn’t need to work). Intel has to be wary about what markets this processor might take away in terms of sales, so it has to be priced accordingly. Add ~$1k for a motherboard that can take the power requirements of a 28-core overclocked beast, and at least 6x8 GB (48GB) of DDR4-2666, then we can imagine that a full ‘base’ system could easily come in at $10k or more. However, for the target crowd, such as high-frequency traders, they would perhaps spend $100k on a bespoke super-cooled system. However many CPUs that Intel wanted to manufacturer (or could even bin), each one would sell, and the people that would want it would be prepared to pay the big money. For anyone looking at a $5k pot for their next high-end gaming PC, unfortunately these parts will be for the 1% of the 1%. For our sneak peek, we got hands on one of the motherboards that Intel used for the demonstration. According to our sources, only one of the models on display was actually capable of 5 GHz. This motherboard is a monster. 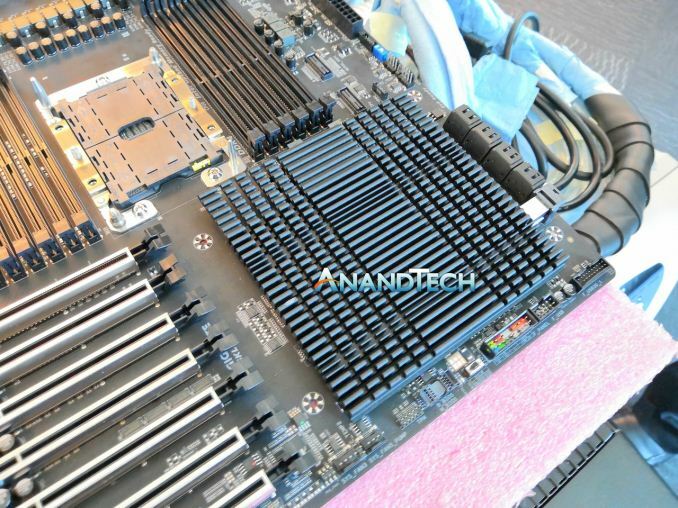 That’s a standard LGA3647 socket, and this is a E-ATX-like (but custom) form factor. Can you see all those phases along the top? I haven’t had time to count them, this news is so rushed. The VRM cooler was copper finned and had four high-powered fans on it. There’s plenty of PCIe slots and storage and even some audio, but for a prototype board it is a beast. 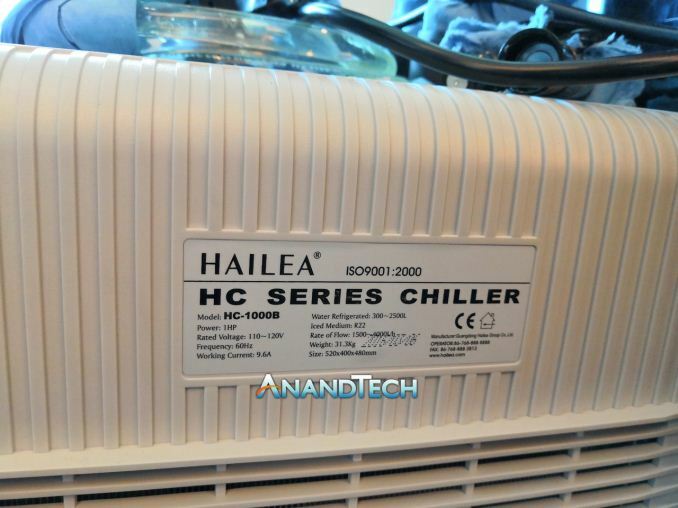 We confirmed that Intel was using a water chiller in the 5 GHz demo, a Hailea HC-1000B, which is a 1 HP water chiller good for 1500-4000 liters per hour and uses the R124 refrigerant to reduce the temperature of the water to 4 degrees Celsius. Technically this unit has a cooling power of 1770W, which correlates to the fact that a Corsair AX1600i power unit was being used for the system. The 32 core Threadripper better be hitting 5 GHz. HEDT isn't overclocking oriented in the first place, it's for professionals. 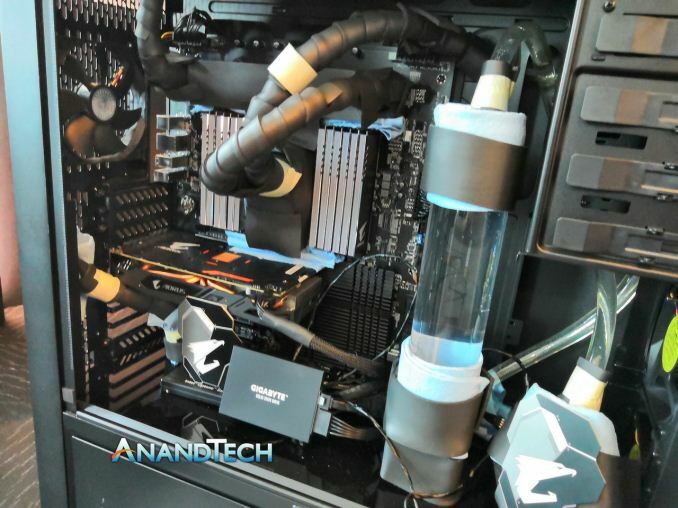 Do you honestly think pro's want to risk their $7,000 rig and their work for extra FPS in games they don't play? I don't think so. 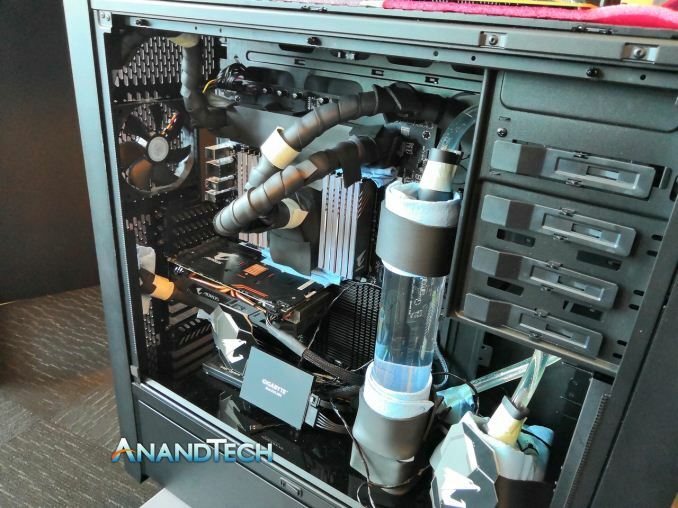 Do you also realize how much it would cost to purchase a 29 phase motherboard + custom loop + water chiller? This demonstration wasn't meant to be practical, it's meant to show off.